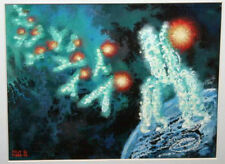 We are presenting for sale an original KELLY FREAS acrylic drawing entitled ANTIBODIES. KELLY FREAS SKETCH WOOZLE THE ALIEN SNAKE s USD 9.95. KELLY FREAS SKETCH QUEEN OF ANGELS #1 s USD 9.95. KELLY FREAS SKETCH PRITCHER MASS s USD 9.95.